Twelve South today launched the latest in its line of BookBook cases, this one for the iPhone 7 and iPhone 7 Plus. Like previous editions, the new BookBook includes wallet slots for credit cards and a driver's license, all housed in a vintage leather-bound case that looks like an old novel. A removable shell protects the iPhone 7 both inside of and out of BookBook, and the case can fold into a stand for the smartphone when viewing videos. 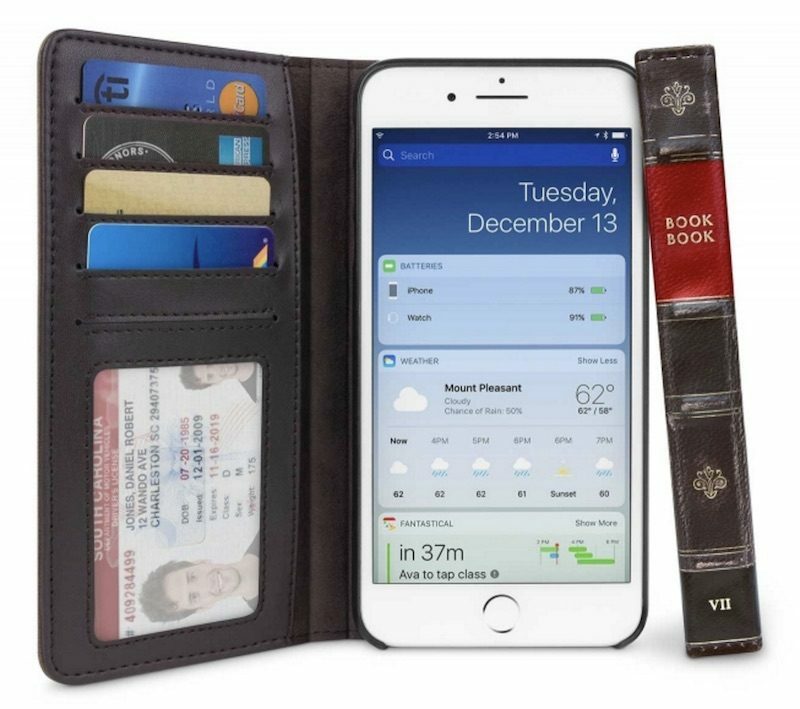 Additionally, Twelve South is launching "Journal for iPhone," a new leather-bound wallet case that's made exclusively for iPhone 7 and iPhone 7 Plus. 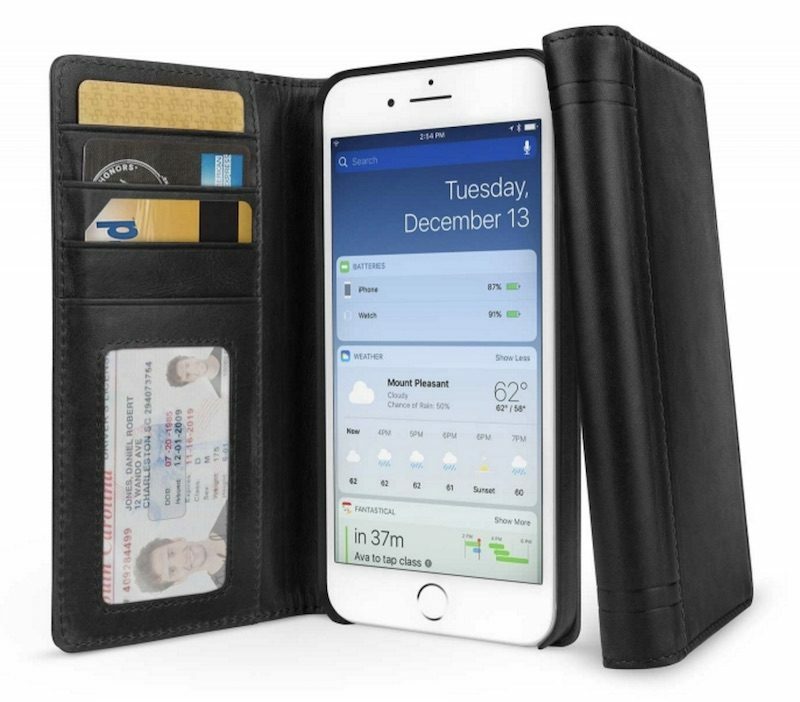 Journal is a more basic leather case that doesn't have BookBook's novel aesthetic, but matches that case's design with credit card slots, a detachable composite shell, and built-in viewing stand. Since 2010, Twelve South has curated a library of cases called BookBook. We are pleased to announce today that not only do we have your favorite vintage BookBook available for the iPhone 7, but we are also introducing an all-new edition called Journal. Modernizing the story, Journal is our newest and most luxurious case. Crafted in full-grain leather covering both inside and out, this handsome folio presents a more refined, clean design. Like BookBook, Journal features slots for cards, cash and ID, streamlining your everyday carry in style. BookBook for iPhone 7 is available for $59.99 in black and brown, while Journal for iPhone is available for $69.99 in black and cognac. I still find this type of case to be very awkward, showing all the CC and ID when talking on the phone. That looks absolutely bloody awful. Does it require a dongle? They keep making these and selling them at a higher price point than most case so there must be some value here, presumably in build quality. The design is not my preference, but what I really don't like is the name: book book. Like it just seems... dumb. I used to love wallet cases as well. Until I left my phone in my friends car (after a long night lol) and didn't get it back for a week. Last time I used a wallet case haha. I have an ultra-cheap generic case like this that handles it nicely - the back is "double-hinged", so when you fold the front back, you can fold it so that the cards are facing in, not out. That mechanism does make it thicker than one that only folds straight back, though. I only use it when I want "minimal stuff in pockets," not as my everyday case, though. I've been waiting for an iPhone 7 BookBook since launch day, but after (somewhat literally) hacking the BookBook from my 6 (I just reamed out the camera hole a little to make room for the bigger camera), I'm not entirely sure I need one unless this one wears out. Speaks well of the durability, though--still in good shape and looking pretty good even after >2 years in my pocket. The Journal is really nice looking and I'd definitely get it over the BookBook except for the fact that it doesn't have the removable inner shell. I rarely take it out, but that's awfully handy when for some reason you do need to take your phone out of the case, and it isn't even any thiner as a result. A hair thicker, actually. That's really too bad. Aside: I really love my BookBook--I went looking for a wallet case when I realized I only ever carried an ID and a couple of credit cards and might as well just attach one to my case, and came up with the BookBook as the best balance of style and functionality. Its only disadvantage (aside from being relatively thick, although no thicker than the no-phone wallet I used to carry) is that the section of material just above the ID bulges out a little since all the cards overlap behind it, and ends up rubbing on the screen. It didn't significantly damage the screen over 2 years of use, but I didn't really like it, so I eventually stuck a thin, correctly-sized piece of microfiber glasses cleaning cloth into the paper money area so it covers the whole surface of the phone. That worked really well, and actually has the side effect of cleaning some fingerprints off the screen while it bounces around in my pocket. It's not the most beautiful thing in the world, but whatever, it works well. Makes me wish they included such a cloth attached to a correctly sized insert with the thing (or made the interior out of microfiber rather than stitched suede or whatever this stuff is. Actually, there is one other thing I don't like--after about 2 years (and with probably some stretching, when I reduced the number of cards I carry) the top slot has become kind of loose, so if I turn the thing upside down when it's open, the cards sometimes fall out. It's not so common it's a deal-breaker or has pushed me to replace it, but it is kinda silly. Also, when you bend the case around to use it as a phone, it often causes issues with the audio. I like the general idea though. Do you have issues with audio quality due to the second noise-canceling mic (I think by the camera?) being covered? ...but actually, I've never noticed this in practice. The mic technically isn't completely covered, since it's still exposed in the camera/flash hole and there's a small gap between that area and the front of the case when it's folded in half, and if you're worried you can pretty easily stick one finger between the front and back of the case to create a gap there (I believe Twelve South recommended this somewhere). I've never heard anybody complain when I didn't do that, though. Makes me think I should run a test. If I can talk my wife into it tonight I'll experiment.